If you’ve always had a liking for radio and you’re interested in taking up a new, educational, and enjoyable hobby, amateur radio, or ham radio is something that you should definitely consider investigating. It’s a way to connect to and interact with other people around the world, and it can provide you with a wealth of valuable information. Some ham radios are even powerful enough to communicate with astronauts in space! What exactly is a ham radio? What can you use ham radios for? What are the benefits of this pastime? What types of ham radios are there? Below, you’ll find out the answers to these questions, but first, we’d like to share with you our picks for the best handheld ham radios that are currently on the market. Which one should you choose? Read through the detailed overviews below to learn more about each model. Once you’ve decide on an option you would like to purchase, click on the yellow links to find the best prices currently available on Amazon. With the Whistler WS1040 Handheld Digital Scanner Radio, you’ll always be in the know. Whether you’re hunting, mountain climbing, traveling on the road long distances, or prepping for survival, you’ll be able to find out the most pertinent information for your needs with this digital handheld scanner. Storing up to 1,800 frequencies and allowing you to search for any frequency transmissions that are in your local area, you’ll be able to connect to any transmission that this device connects you to. Plus, it offers free-form memory organization, which gives you instant access to the frequencies you use most. This handheld ham radio is outfitted with the most advanced audio hardware, which allows for crystal clear transmission. Furthermore, it offers incredible reception; users of this device have said that signals that are usually difficult to comprehend on other scanners are perfectly crisp and clear on the Whistler WS1040. It also features Skywarn Storm Spotter technology, which gives you access to impending weather reports before they’re released on radio or television, so you’ll be able to make the necessary preparations as soon as possible. It’s equipped with data cloning, too, so you’ll be able to transfer any data you program onto the device to other SW1010 scanners. The multi-color LED screen is easy to read and programmable. It also features programmable audible alarms. Final Verdict: The Whistler WS1040 Handheld Digital Scanner Radio is feature-rich, easy to use, and will certainly keep you abreast of pertinent information; however, do be aware that it can take some time to familiarize yourself with all of the features that it offers. Next on our list of the best handheld ham radios is an option that comes from Yaesu. This highly reputable manufacturer is known for offering some of the best quality amateur radios, and the FT60R is definitely no exception. Feature-rich, easy to use, and durable, this handheld two-way radio will keep you connected in all types of environments. 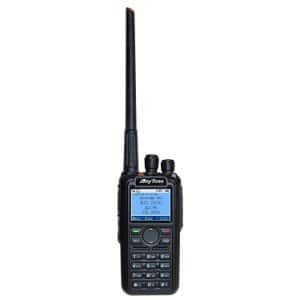 A dual band VHF/UHF transceiver, this device boasts a wide assortment of programming capabilities. For example, it features more than 1,000 memory channels, 10 memory banks, and nine DTMF audio dialer memories. Plus, it offers instant access to NOAA weather, so you’ll be able to use it as a weather radio and stay ahead of any storms that may be coming your way. 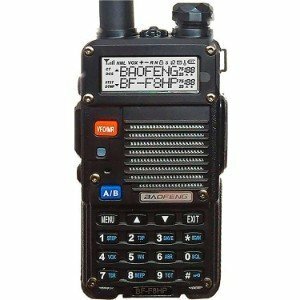 This transceiver receives both 108-520 and 700-999 Mhz and sends out 122-148 and 430-470 Mhz. Operating modes on this device include memory-only and mono-band; plus, there’s an RF squelch, which allows for clearer reception. This device also features an Auto Range Transponder System (ARTS), which is exclusive to Yaesu and notifies you when the handheld ham radio is out of range. With an LCD display, you’ll have no trouble reading the settings, and thanks the die caste, water resistant case you’ll have peace of mind knowing that you can use it in all types of environments. 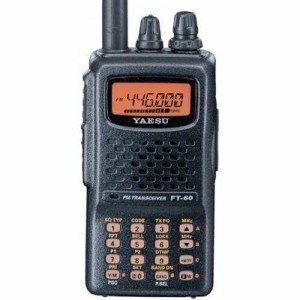 Final Verdict: The Yaesu FT-60R is an affordably priced, durable handheld ham radio that offers a great selection of features to keep you connected. It’s easy to use, offers clear reception, and according to most users, it’s a great investment for the price. The AnyTone AT-D868UV GPS Version II is an outstanding handheld ham radio that doubles as a handheld GPS, so it’s a great choice for hiking, biking, or any other activity that requires you to keep tabs on your location. 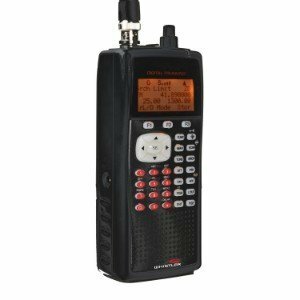 It’s easy to use, durably constructed, and loaded with features that, according to most customers who have used it, makes it an excellent device for communicating with other hams and staying abreast of the latest information. This dual band radio was designed to work with DMR Tier I and Tier II requirements. It offers exceptional performance on analog and digital operation at either VHF or UHF frequencies, so it really gives you a ton of options. Plus, it provides an incredible 4,000 channels, 10,000 digital talk groups, ad 150,000 contacts; some of the highest numbers we’ve ever seen on a handheld ham radio! Thanks to the color display, you’ll have no trouble keeping tabs on how this device is operating and functioning. It also offers up to 7 watts of power, which is pretty impressive for a handheld device. It’s powered by a 31000mAh rechargeable lithium ion battery. It is important to note, however, that this handheld radio is now compatible with CHIRP and RT software; you do have to have access to a Windows PC in order to fully program it. Final Verdict: The AnyTone AT-8686UV GPS Version II is a high quality, durable, and powerful handheld ham radio that doubles as a GPS. It’s easy to use and offers great reception, too. The BaoFeng BF-F8HP (UV-5R 3rd Gen) 8-Watt Dual Band Two-Way Radio is an upgraded model of the manufacturer’s UV-5R ham radio. It’s an excellent device for anyone who is just starting to dive into the world of ham radio communication. Why? – Because it’s affordable, it’s very user-friendly, and it comes with all of the basic features. Most notably, it comes with full concierge support, which is good for one fully year after purchase. That means that if you have any issues using it, all you have to do is contact the support center and one of their representatives will help you; hence the reason why it’s such a great option for beginner ham operators. In addition to the handy 1 year customer service that comes with this two-way radio, it’s also equipped with ample features. It offers three power settings, and it has twice the power output as the UV-5R; the original model offers 4 watts of power, while this one offers 8 watts, which is a significant improvement in its functionality. It’s also a lot more durable, as it boasts a higher quality shell, so it can withstand wear and tear a lot better. Lastly, this model is powered by a battery that is 30 percent larger than the original model, so you’ll be able to use it for longer periods of time without having to recharge; many users said that it held its charge for a full 24 hours. Other handy features include a built-in flashlight and radio. Final Verdict: This handheld ham radio is a great option for novice ham radio users. It offers all of the necessary functions, plus a few bonus features; and, it’s easy to use and comes complete with all of the necessary accessories, as well as a fully year of concierge support. Last but not least is the TYT MD-380 – DMR/Moto TRBO Ham Radio. 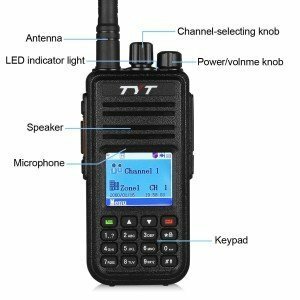 This is the first DMR digital radio offers by TYT – a reputable manufacturer of ham radios – that uses Time-Division Multi-Access (TDMA) digital technology. That means that it can be used with any Motorola TRBO Tier I and Tier II radios, including those that are made by a variety of manufacturers, such as Kenwood and Hytera, so It is incredibly versatile. This device provides crystal clear receipt so that you can enjoy crisp voice communication. It offers both analog and digital operating modes, so you can flip between the two with ease. Operating on 400 to 480MHz frequencies at as many as 5 watts, you’ll be able to reach great distances with this long range two-way radio. Other notable features include 1000 channels, an LED display, channel and priority scan, as well as an easy to use DTMF keypad. It also offers private call, group call, and all call features, and it comes with all of the accessories that are needed. Final Verdict: The TYT MD-380 is an impressive handheld ham radio that is easy enough for beginners to use, yet offers enough features to satisfy even the most avid ham operators. A handheld ham radio, as the name suggests, is a portable device, which means that you can take it with you anywhere you go. Because of their portability, many people prefer to stationary devices, like mobile ham radios, that which are permanently fixed in place. What are the benefits of a handheld ham radio and why should you consider investing in one? Keep on reading to find out. When the Internet and phones (both landlines and cell) go down, you can still communicate with a handheld ham radio. That’s the primary benefit of a handheld ham radio; it’s an emergency radio that can be used to connect with people when there’s no other way to communication. Another benefit of these devices is that they can be used in all types of locations; for example, a hunting two-way radio can be useful when you’re out in the thick of the woods, as you can communicate with other hunters, receive emergency alerts, and if the device has GPS, track your location. If you’re hiking, skiing, or participating in any activities where you come in contact with moisture, a waterproof two-way radio is a great way to stay connected. Plus, communicating with ham radio is just fun! If you have a liking for communication and radio technology, it’s a great pastime. With more than 2 million ham operators around the world, you’ll be able to become a part of a huge global community. Given the benefits that a handheld ham radio offers, there are many reasons why you might want to consider investing in one. You can use these devices to communicate from literally any location; from your home, your car, the middle of the ocean, a desert, a jungle, or even the highest mountaintop. These devices are excellent in emergency situations, as they work anywhere and don’t require a connection to the Internet, satellites, or phone systems, which means that when power facilities are out, you’ll still be able to communicate. Depending on the features that a handheld ham radio offers, this device can be used as a car GPS, a weather radio, an emergency radio, or even f flashlight! In other words, with a handheld amateur radio, you’ll be connected in any situation. Whether you’re looking for a new hobby or you want to be prepared for an emergency, a handheld ham radio is an excellent investment. All of the options listed in our review are durable, easy to use, powerful, and offer a range of features that will allow you to enjoy the full potential of amateur radio.